With all of the wonderful breads and decadent pastries in the Breakfast Entertainer Basket, everyone will agree that breakfast is the most delicious meal of the day. Tucked inside a charming hyacinth basket with a hinged lid and handles is a plentiful assortment of Wolferman's® English muffins, including our traditional and super-thick signature sizes, and English muffin bread. You'll also find premium fruit preserves, fine baked goods, and robust coffee. 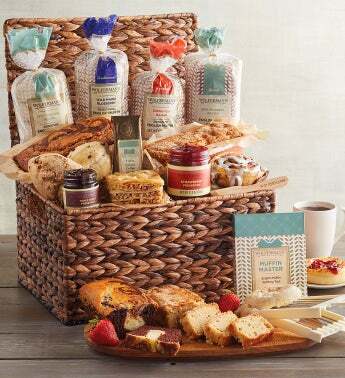 Feed a large group of friends or family with this impressive breakfast gift basket, or have enough gourmet treats for days of enjoyment.